For the past couple of nights I have been trading Facebook messages with a good friend that I have known since high school. He has been running a lot and him and I were trading stories about races that we have run, he spoke very highly of the Newport Marathon. A few minutes ago I decided to check out the marathon to try and see if I wanted to run the Newport Marathon this fall. 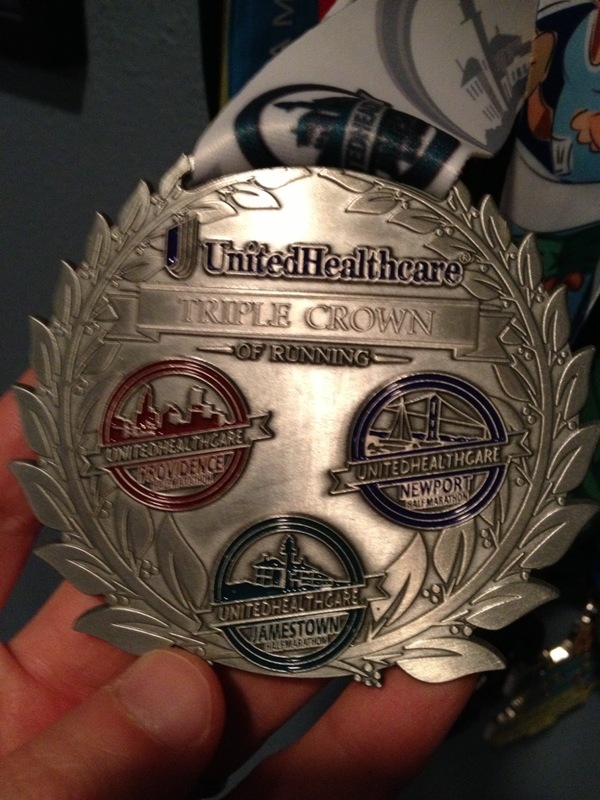 As the headlines scrolled across the screen I saw a link for the United Healthcare Triple Crown of Running. I have run one half marathon in my short running career and that half marathon was the best race that I have ever run. I loved the NYC Marathon but I ran like crap, when I ran the Surftown half marathon last September I feel that I was in peak running shape. As I have thought more and more about running four half marathons in six months I have become more and more excited about the challenge that is in front of me. I have already signed up for the Providence Half Marathon which will be held on May 4th. This is the first leg of the triple crown and a race that I'm really looking forward to running. The second leg, the Jamestown Half Marathon on July 12th could be very interesting. July is a mean month that could bring high temperatures and high humidity, I'm wired differently and love that weather but have only run a race of ten miles in such conditions. The third leg will be the most difficult, I will run the Surftown Half Marathon in September because of my love for that race. That will only give me one month to prepare and recover to run the third leg of the triple crown in Newport on October 12th. It will be a huge test but a test that I plan on completing.